Over the weekend I had several people comment on my face. I think the word was "glowing" and they were convinced I was pregnant (I'm not). I thought it was so funny because in the past month or so I've really noticed that I'm finally happy with my skin! I'm not acne prone, but I had never liked my skin texture or the occasional red splotch I would get. After getting questions about what I'm using on my face, I thought I'd share with you the daily skin care routine that I've found to be the best for my skin. I use St. Ives Apricot Scrub every morning when I first get in the shower. Every morning I cleanse my face with Origins A Perfect World cleanser. cleanser on my face for 30-45 seconds. After moisturizing I lightly brush on Mary Kay Mineral Powder. 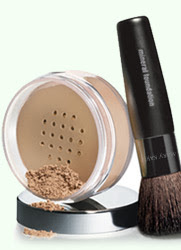 Then I use a little bit of Mary Kay Mineral Bronzing Powder in Sandstone. with Aveeno Ultra Calming Foaming Cleanser. without taking off all my makeup and washing my face. Again, this is what I've found to be the best for my skin. It takes a while of trying different products and routines to figure out what works best for you. For other skin care products that I like and use, see this post. Also check out Lindsay's blog! She gives amazing skin care tips that I have found really helpful! I have to find me some Origins products - I'm going to google it right now! Thanks for the tips - my skin has always been my trouble spot. It is the most annoying processes for me in the morning! I love Lindsay's tips! I just started using argan oil for a moisturizer. Not sure how it is going to go yet but it seems to be the new in thing! As soon as I saw on facebook that you had posted this I knew you would reference those comments from this weekend. My favorite was Emily's "Your face looks good, what do you do to it?" Hmmm are you sure your not pregnant? ;) You two would make pretty cute babies! Love your routine! My Mom sells Mary Kay and has a pink Cadillac haha! I have used that bronzing powder and I love it! that is awesome. i'm switching up my skin care routine now...i think living in the city i really need a daily exfoliator. i'm definitely looking at origins after your previous post touting all their products - my other friend loves their stuff, too. I use that same facial scrub too. I just started trying out a new skin routine- suddnely I've got more break outs, don't know if it has anything to do with getting off the pill but it's driving me crazy! I love posts like these, keep them coming! Hmm that's good to know. I like to change up my skin care routine every once in a while. Growing up, I always went to bed without washing my make-up off. Now, when I get home from work, I always want it off first! I love the Say Yes to Cucumbers line. It feels so good without feeling thick and goopy like some moisturizers. I've heard great things about the origins creams too!